It’s prime time for pride time because the 34th Annual San Diego LGBT Pride Parade and Festival takes place this weekend. On Saturday at 11 a.m. the pride parade sweeps the streets from Hillcrest to Balboa Park with over 180 celebrating floats. Then on Saturday and Sunday, the party continues with the pride festival in Balboa Park featuring multiple entertainment stages, musicians, bands, comedy and dance performers, art exhibits, music and great food. The parade is free and single day tickets to the festival are $20. pre-party on Saturday and the official competition on Sunday. 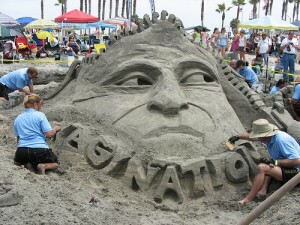 From 9 a.m. to 2 p.m., teams of professional and amateur “sand carvers” get down and dirty as they create some of the most extraordinary sculptures out of sand and water. The sand masterpieces will be available for viewing until 4 p.m., before the tide comes in and Mother Nature shows those sand carvers what she really thinks about their work. If you like visors (what? how random! ), head down to PETCO Park to help the San Diego Padres celebrate their 40th anniversary this Saturday as they play the Colorado Rockies. The games start at 7:05 p.m. and all fans in attendance will receive a complimentary Padres retro visor as a thank-you gift… See, I was going somewhere with that. This Saturday, check out the Old Town Saturday Market on Harney Street, one of the largest weekly artisan fairs in San Diego. Here, you’ll find handmade pottery, jewelry, clothing, blow glass and more. There will also be live music and festive entertainment. Ole! This entry was posted in Insider Tips, San Diego Events and tagged 5 to try, balboa park, baseball, festival, free, imperial beach, music, old town, Petco Park, summer, theater, things to do by Stephenie. Bookmark the permalink.